Medallion is a symbol pattern like medal which is arranged in the center of the carpet. It is called Toranj in Persian, and Medallion in English. The design, which is called Lachak Toranj is arranged to put the Toranj in the center and Lachak (a quarter of Toranj) in the four corners, is a traditional design to be used for the binding of Koran. Medallion design is a design came from Lachak Toranj design with Medallion in the center. Mehrab Design is a design composed of Mehrab shape. The Mosque, Islamic temple has a unique aspect with a dome, sharp at the top. The shape from the above, be put to the plane (or section) is called "Mehrab". Mehrab is set up on the wall in the Mosque, Islamic temple to show the direction of Mecca. By this Mehrab, the Moslem can pray at all over the world toward Mecca (Mehrab). This is designed from the beautiful and dynamic decoration tiles spreading in a radiation shape in the center of round ceiling in the Mosque. When you enter a Mosque, Islamic temple, and look up right above, the thing you will find first is the interior decorations by the beautiful and dynamic decoration tiles spreading in a radiation shape in the center of round ceiling (the top part of dome in the outward). The design which is composed by the above is called Gonbad. There is a theory that "Medallion" is the design of the center part cut from this Gonbad. The design, having no such composition like Medallion or Mehrab, arranged by full patterns inside of the field as a whole for example by floral patterns. This is a design that patterns are arranged in the rectangle or square division. Kheshti in Persian means sun dried brick. This design is like the piled-up bricks, so, it is called Kheshti. It is said that this design is originally expressing a garden scenery divided by channel or lane. We can feel some longing for abundant green and water. A design the field is composed by portrait, scenery, etc. A design "the tree of life" is composed as the axis and the branches and leaves are expressing infinite stretch from the earth to sky. From the old days, "the tree of life" has been preferred by people as "the tree of paradise" which brings ageless long life and descendant prosperity. A design composed by hunting scenery with riding King and Lord. 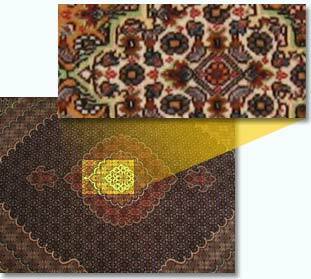 The traditional design came from the era of Achaemenes Dynasty and Sasan Dynasty in ancient Persia. Hunting was a superlative amusement and also a symbol of bravery. A design of flower in vase. Goldan in Persian means vase. A design of vase with flower is Goldani. It is said that the vase is expressing the longing of the people, living in dry area, for abundant green and water. 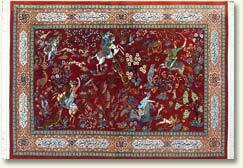 A design Goldani is arranged continuously overall the carpet. Sarasari in Persian means all or whole. 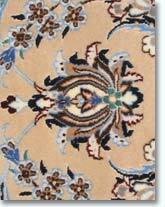 A design Goldani is arranged continuously overall the carpet. Dance feeling curve like vine which is connecting flowers in the Shahabbas pattern. 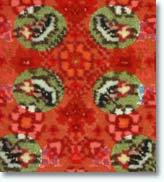 Grape vine, arabesque, and so on are the motif. Came from the name of King Shah AbbasI, the Safavids Dynasty in 16th century. The section of flowers, for examples, rose, lily, lotus, etc., is the motif. Called Mahi because the pattern of leaves which is surrounding small flower can been seen like a small fish. Mahi in Persian means fish. It is also called harati because the cradle of this pattern is harato, the Persian city (in Afghanistan, now). 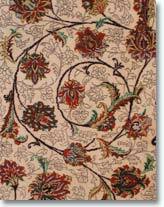 When such "Mahi and Flower" patterns are connected, a carpet like the following will be arranged. 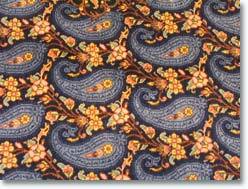 As the town paisley in Scotland used Bote patterns for the pattern of Indian shawl., this pattern became to be called paisley too. Beyond that, there are pine cone theory, drop water theory, and so on.